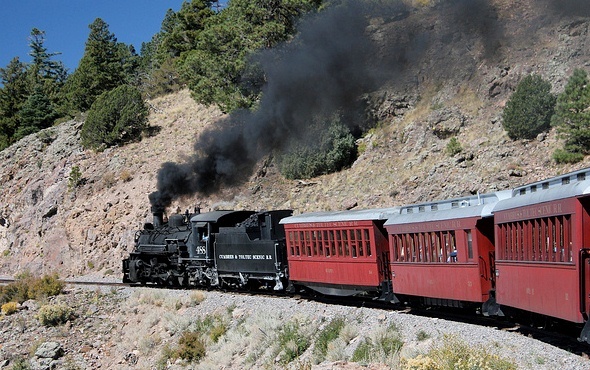 The Cumbres & Toltec Scenic Railroad is an 1880 narrow gauge train between Antonito, 28 miles south of Alamosa, and Chama, N.M., calling itself America’s highest and longest coal-fired, steam operated, narrow-gauge railroad. Now operated by the states of Colorado and New Mexico through the nonprofit Cumbres & Toltec Scenic Railroad Commission, it travels over 10,015-foot Cumbres Pass, the highest mountain pass reached by rail in the United States. From there it passes over the 137-foot Cascade Trestle and over 800-footToltec Gorge with a view straight down. Trains leave daily May through October from both Antonito and Chama and stop at Osier, the halfway point, for lunch. Visitors can ride the entire 64-mile route or go halfway up and ride back to where they started. Special trains include a sunset ride, a geology tour and holiday events.